Are You Targeting the Best Keywords for Veterinarian Rochester, NY? Most SEO Service Providers and Online Marketing Firms do not conduct thorough Keyword Research. You probably know these companies, because they’re the ones who call you on the phone every week tying to sell you on one of their allegedly foolproof solutions. The sad thing is, most of these Online Marketing Companies rely on you to provide a list of the best Keywords for Veterinarians in Rochester NY. However, without thorough Keyword Research, it is not possible to determine the best Keywords to target with your SEO (Search Engine Optimization). Search Engine Optimization (SEO) is the process of getting your Website FOUND on the Internet, with the goal of being listed on Page 1 in Google for the most important Search Phrases (i.e., Keywords). Keyword Research shows you what Search Phrases are being searched the most in regard to your industry and location. You learn the best Keywords for Veterinarians specific to the Rochester NY region. All of your SEO efforts as well as your Pay-per-click (PPC) Campaign investments hinge on utilizing the best Keywords. But, are you? In July 2018 when this Keyword Research was compiled, Google provided Colin Chase with Keyword Usage Data for the Rochester NY region spanning January 2016 through June of 2018. After an in-depth analysis of the Keyword Usage Data, Chase devised the following Keyword Ranking for Veterinarian Rochester, NY. You probably already knew some of these, but the entire list includes over 100 of the Top Keywords. 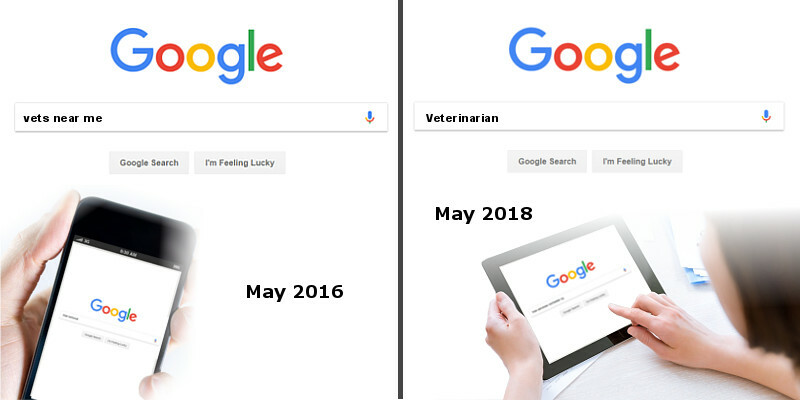 It is interesting to note that 4 of the Top 10 Keywords for your industry are actually naming a specific Veterinarian clinic rather than a generic search for “veterinarian near me” or similar. This indicates these Clinics have high brand-recognition, as well as a large customer-base. There are numerous Keywords that you might not suspect among the Top 30, including searches for different types of Veterinarians. This list shows you specifically what pet-owners are searching for in Google, as this Data comes from Google. We have the entire list including over 100 Top Keywords relating to “Veterinarian Rochester, NY”. But you have to contact us to get this Keyword Research Report. Call or Email Colin Chase today to get your copy of the Keyword Research Report for FREE! Keyword Usage varies month-by-month and year-over-year. For instance, the volume or number of Searches for a specific Keyword Phrase changes over the course of the year due to changing seasons and differing weather. And much more subtly, changes in Keyword Phrases also occur due to trends in popular American culture as well as trends in your local vernacular. People don’t always search for the same exact thing, even when they want the same product or service. This is seen throughout the Keyword Usage Data, fluctuations in the number Searches for specific Keywords over time. In order to see Keyword Trends, it is easiest to create a graphical representation of the Data. So, I have created over 10 Keyword Usage Charts that map-out the Top Keywords’ Usage Data from January 2016 through June 2018 for the Veterinarian industry in Rochester NY. Next I will SHARE THESE CHARTS WITH YOU for FREE on the following page (for the inquiring minds who just gotta know). Trust me, the Data Points are definitely worth seeing. Plus, you can learn the Best Keywords for a Veterinarian to use. Click Here to go to Page 2 to see these Keyword Usage Charts!